Local Concrete Contractor Company in Kiel, WI. Driveways, stamped patios, foundation slabs, floors & more. Spencer Concrete is a premier concrete construction service company that installs, repairs, replaces and removes; concrete in Kiel, WI. Concrete services include; paving concrete driveways, patios & sidewalks, decorative colored stamped concrete patios, concrete foundation slabs/floors, poured concrete basement footing/wall foundations, basement concrete floors, asphalt & concrete removal and more. 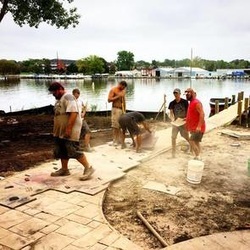 We provide residential, commercial, industrial, and agricultural concrete projects including; gray concrete flat work, concrete foundation slabs/floors, poured concrete walls & decorative colored stamped concrete patios in Kiel, WI. We are confident to be one of the most Affordable Quality concrete contractors in Kiel, WI. 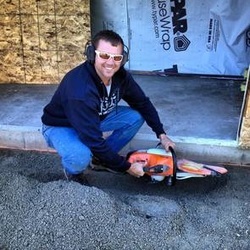 We use rod reinforcement and premium grade, straight cement concrete for our concrete driveways, stamped concrete patios, concrete garage slabs and concrete floors. We seal our concrete work with commercial grade concrete sealer. We saw cut our concrete driveways, concrete patios, concrete slabs/floors to allow for expansion & shrinkage control. ​We are a local concrete construction contractor servicing Kiel, WI & East Central Wisconsin area. "We strive to to be one of the best, local concrete contractors in Kiel, WI by providing affordable quality concrete work!" 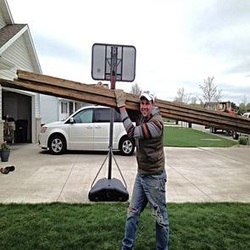 Spencer Concrete | Kiel, WI concrete contractor company that cares! Install/removal/repair/replace Concrete Driveway Paving Contractor Concrete Company in Kiel, WI. Spencer Concrete, installs, removes, replace, and repairs concrete driveways in Kiel, WI each year. We are a concrete driveway paving and removal contractor that takes pride in our concrete work. We setup to pave concrete driveways with the proper components including; compacted stone base, proper pitch, rod/rebar reinforcement, premium concrete mix & saw cutting control joints for shrinkage & expansion control for a new long-lasting concrete driveway! 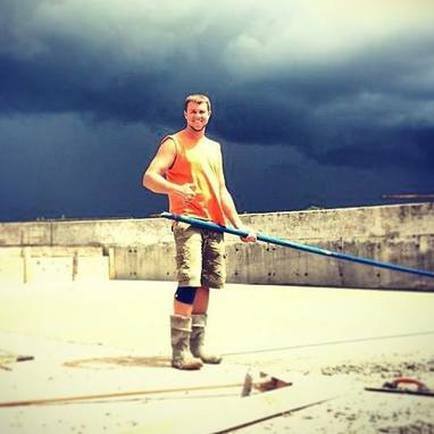 Concrete Foundation Slabs & Floors Concrete Co. in Kiel, WI. We make sure your concrete floor or concrete foundation slab in Kiel, WI is poured to the proper specifications; compacted stone base, rod/rebar reinforcement, premium concrete mix design, smooth steel trowel finish, cure sealed for maximum surface protection, and saw cut control joints for shrinkage and expansion control. Allowing for a proper concrete foundation to build your garage, building or home on. Decorative Colored Stamped Concrete Contractor in Kiel, WI. Decorative colored stamped concrete is one of our all time specialties. Whether you are looking for a colored concrete patio or a decorative stamped concrete patio in Kiel, WI we can help you design & install. We have many concrete colors and concrete stamp styles to choose from allowing you to design your custom stamped concrete patio. Every year we design & pour beautiful works of art! At Spencer Concrete we work hard to be Kiel, Wisconsin's premier concrete construction service contractor. Our goal is to provide affordable quality concrete for residential, commercial, industrial, & agricultural concrete projects. We are confident to be one of the most Affordable Quality​ concrete companies in Kiel, WI. 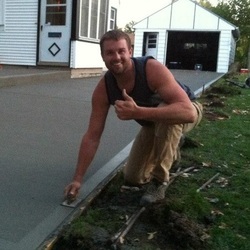 If you are wanting to add, install, remove, replace, or pour a new/old concrete gray concrete driveway, apron, patio, decorative colored stamped concrete patio, sidewalk/walkway, concrete garage slab/floor, basement concrete floor, poured foundation walls, addition footings & frost walls or more in Kiel, WI, give us a chance to bid your project! 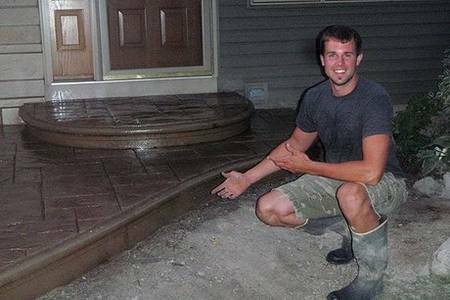 We install new concrete, repair existing concrete, remove and replace old concrete driveways, concrete aprons, concrete patios, garage/basements concrete floors, or foundation concrete slabs in Kiel, WI. Looking for concrete prices in Kiel, WI? Concrete cost varies with the type, size and thickness of the concrete project. 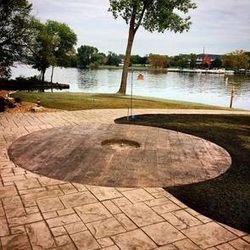 Spencer Concrete provides discounts for large concrete work including; large concrete slabs, large concrete driveways, large decorative stamped concrete patios. Looking for a price on concrete work in Kiel WI, contact us! We can be your concrete specialist. Install/Remove/Replace Concrete Driveway Paving Contractor Kiel, WI. Are you looking to pave a new concrete driveway in Kiel, WI? Concrete driveway paving is the way to go for your new or existing driveway, because concrete will out last asphalt driveway or brick paver driveways. We do have decorative concrete options for paving a new concrete driveway. Do you have an old blacktop/asphalt driveway your are looking to demo and replace with a new concrete driveway? We remove old blacktop/asphalt, and concrete driveways, and install with a new paved concrete driveway. We start with removing the existing asphalt/blacktop or concrete driveway that has been cracked, settled, and shifted and replace with a new concrete driveway pavement. Driveway concrete removal can be very unsafe & difficult. We have the proper equipment to remove concrete driveways safely and dispose of the old concrete driveways. We always try to recycle the old asphalt/blacktop and concrete. Decorative Colored Stamped Concrete Patio Contractor in Kiel, WI. Are you looking for a beautiful decorative concrete colored stamped patio? You can have your concrete patio colored and patio stamped. We color and stamp concrete patios. 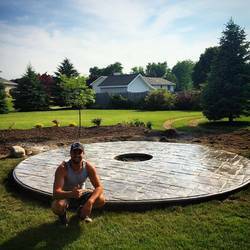 We are one of the best decorative colored stamped concrete patio contractors in Kiel, WI. We color concrete patios to almost any concrete color, then stamp concrete patio to your choice of stamp concrete texture we have to offer. We have many concrete colors to choose from for coloring concrete. After the concrete patio is colored, poured, stamped and cured; we detail the stamped concrete patio and seal it with a decorative concrete sealer to bring out the true beauty of stamped concrete. We are confident to be one of the best decorative colored stamped concrete companies in Kiel, WI. Poured Concrete Walls | Concrete Foundation Contractor in Kiel, WI. Contact us today, if you are looking for poured concrete wall foundation contractor for your home, garage, shed, or any building that is requiring a poured wall, concrete foundation package. We offer complete poured concrete foundation wall packages in Kiel, WI. We stake the site, excavate the area for a concrete basement, or concrete footings and poured concrete frost walls. Install the poured concrete foundation walls, poured concrete walls, poured basement foundation walls and/or garage foundation walls and all concrete flat work. We offer poured concrete walls/footings and concrete footings for concrete foundations for new home foundation, home addition foundation, shed foundation & building foundations. 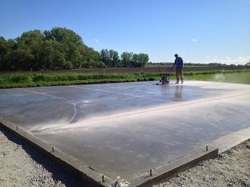 Concrete Garage Foundation Slab Contractor in Kiel, WI. You can be confident to have a proper concrete garage slab for your home, garage or building. We are a concrete garage slabs foundation contractor in Kiel, WI. Concrete slabs and concrete floors can be poured to any size. The traditional gray interior concrete slabs we pour are all steel trowel finished for a smooth texture. We can pour large concrete slabs and concrete floors for concrete garage slabs, buildings, storage shed slab, storage building slab, airplane hangers, steel/pole buildings & municipal buildings. 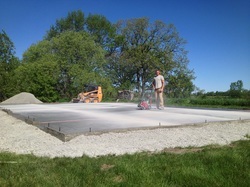 Let us be your garage concrete slab contractor in Kiel, WI. Concrete Floor Contractor in Kiel, WI. Are you looking to pour an interior concrete floor with a contractor in Kiel, WI? Our work is the foundation of your future. We pour concrete floors for interior concrete work. We pour residential and commercial concrete floors for concrete basements floors and concrete floors on a foundation for your building or shop. If you would like a price on a concrete floor for you new home or building, contact us. Exposed Aggregate Concrete Contractor in Kiel, WI. Would you like a concrete driveway or patio with exposed aggregate concrete from a contractor in Kiel, WI? We install exposed concrete driveways, and exposed concrete patios. Exposed aggregate is a decorative concrete option that remove the top layer of the concrete slab or floor, and "exposes the aggregate" below. Exposed aggregate is a beautiful option for concrete patios and concrete driveways. The aggregate in the concrete is the hardest part and offers the most abrasive ability. Contact us if you would like more information on an exposed aggregate patio/driveway. Asphalt/Blacktop & Concrete Removal Contractor in Kiel, WI. Is your asphalt/blacktop concrete driveway, patio, slab or floor cracked, shifted or settled? If you have an asphalt/blacktop or concrete removal project that needs concrete removal we can demolish and remove concrete driveway, demolish and remove concrete patios, remove concrete slabs and floors. We are an asphalt and concrete removal contractor in Kiel, WI. We can replace the complete driveway, concrete patio, concrete garage slab, concrete floor or you can have us provide a bid for replacement of concrete in smaller sections. Complete concrete removal services and replacement services including sawing, demolishing and concrete removal. Asphalt and concrete removal can be very dangerous if you do not have the proper equipment. We take care of the demolishing the concrete and asphalt by breaking up concrete into small manageable pieces and disposal with our commercial concrete equipment. With the right equipment you can make short work of removing concrete driveways, concrete patios, concrete floors and slabs. We always try to recycle the concrete or black top that needs to be removed. We also are a concrete sawing/cutting contractor. Residential Concrete Contractor in Kiel, WI. We are a residential concrete contractor in Kiel, WI. We install concrete driveways, concrete patios, concrete garage slabs, concrete foundation walls, and concrete removal. We are confident to be one of the best residential concrete companies in Kiel, WI. Commercial Concrete Contractor in Kiel, WI. We are a commercial concrete contractor in Kiel, WI. We install commercial concrete slabs, commercial concrete floors, commercial concrete paving, commercial concrete foundations. We are confident to be one of the best commercial concrete companies in Kiel, WI. If you are looking for an affordable quality concrete company in Kiel, WI, We are confident you will be in good hands if you give us a call. We will be happy to give you a bid for your concrete project!